Buyer's Guide: Pet Medications & Pet Vet Supplies for Dogs and Cats, Frontline Plus from $25.95, Heartgard Plus from $19.95. Name Brand Pet Supply @ Discount Price! 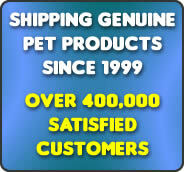 Need pet supplies direct for your dog and cat? Buy discount vet products online and save! Buy pet supplies online and save over 40% on all name-brand vet products. Compare our cheap prices with your local vet or pet shop on leading pet supplies such as Trifexis, Revolution, Frontline Plus and Heartgard Plus. Also compare our cheapest discounts to other online stores like 1 800 pet meds or pet rx care with any pet meds coupons / discount / promotion codes. Select from a wide range of quality vet supplies, pet products including flea treatments, heart worm prevention, tick control, ear treatments and more. With a flat postage for every order and prompt delivery world-wide, your pet supplies and products are delivered conveniently straight to your door. Advocate or Advantage Multi Is a monthly spot-on type medication for the prevention of heartworm, and the treatment of fleas, hookworm, roundworm, whipworm, and mite infestation for dogs and cats. Frontline Plus is the number one choice for flea and tick protection against the annoyance of these external parasites. It's easy to use, offers quick and effective protection against fleas and ticks, and it delivers continuous protection for your dog and cat. More on Frontline below. Comfortis is chewable beef-flavored tablet that kills fleas and prevents flea infestations on dogs for a full month. Only Comfortis offers you all of these benefits in a single product: Starts killing fleas within 30 minutes. Trifexis (spinosad + milbemycin oxime) is an all in one palatable, chewable tablet for dogs. It kills fleas, prevents heartworm disease, and treats and controls adult hookworm, whipworm and roundworm infections. Drontal or Drontal Plus is a broad-spectrum anthelmintic for the treatment of domestic dogs and cats. Drontal Plus covers roundworms and all main tapeworms. Given as a single dose, there is no need to give this product on an empty stomach. Use one dose every 3 months to stop worms dead. The drontal tablet that is specifically formulated for cats. Can be used from 6 weeks of age. Terramycin (oxytetracycline HCI) is an antibiotic, bright yellow in color, possessing potent antimicrobial activity. It is one of the most versatile of the broad-spectrum antibiotics, and is effective in the treatment of infections due to gram-positive and gram-negative bacteria, both aerobic and anaerobic, spirochetes, rickettsiae, and certain of the larger viruses. Rimadyl is a non-steroidal anti-inflammatory (NSAID) used to treat pain and inflammation due to arthritis and other joint diseases, including hip dysplasia. It's also used to reduce fever. Activyl is a monthly flea treatment that works like no other flea product on the market. Activyl works by using a method called bioactivation, a method in which the active ingredient, indoxacarb is fully activated by using the flea's own enzymes. Activyl Tick Plus works to break the flea's lifecycle by killing not only adult fleas, but also flea eggs and larvae, which reduces the chances of your pet becoming reinfested by fleas. Activyl Tick Plus also contains permethrin, which provides a broad-spectrum tick protection and kills four major tick species, which reduces the risk of your dog contracting a deadly tick-borne disease. Seresto is an effective, reliable alternative to monthly flea and tick topicals that lasts for 8 months. Seresto is a flea and tick collar for dogs and cats that uses exciting, innovative technology to release the active ingredients in controlled doses over an extended period of time.